I consider myself to be pretty well travelled, I have backpacked in my youth and am always open to an adventure. 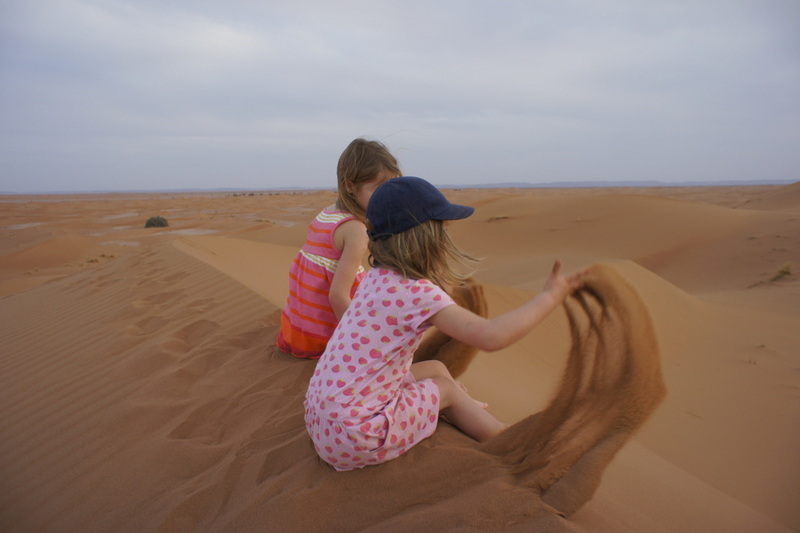 However, I haven't done that much travelling with the children outside of Europe and I must admit, the prospect of travelling in Morocco with three young children aged 6 and under was one that I faced with a certain amount of trepidation. The children (all girls) are well-behaved so I wasn't worried about them running off or being out of control, it was more a question of whether they would get anything from the experience and, even more so, would it be a holiday for me? Getting to Morocco isn't a problem - the 3 1/2 hour flight is very easy and we chose to fly with BA so that we could bring car seats with us and not have to fight tooth and nail to sit together. Having been up the night before downloading films on to our phones, the children settled into watching tv whilst I opened my book. A good start. Once off the plane, we were waved quickly through immigration and found all of our bags had arrived, as indeed had the transfer. All very easy. We had managed the transition form the UK to North Africa and the children had barely noticed. That evening, tired and hungry, we set off to Marrakech's main attraction, the Djemma El Fna, a chaotic square where food vendors, snake charmers, acrobats and story tellers congregate every evening. Walking through the souks, with motorbikes blaring past, donkeys getting in the way, people trying to sell to us and the call to prayer wafting through the air, I was struck by how different everything was. People, noises, smells there was nothing familiar about this place. The children were wide eyed as we saw a family of three squeezed on a moped. Arriving at the square we were all a little shell shocked. Wolfing down a pizza, the girls were tired, excited and a trifle over-whelmed. I was relieved, we had made it here all in one piece and had managed to find food that everyone could eat - by no means a guarantee as one of my brood is the world's fussiest eater. The next day we left Marrakech and headed out over the mountain pass to the desert. Passing donkeys pulling carts full of hay, women carrying bundles on their heads and stalls with meat hanging out to dry we drove higher and higher before descending down into the barren desert. I had warned the girls that the desert initially would be rocky and not sandy and they had been fairly incredulous at the prospect. However, they quickly got used to their new surroundings and within 10 minutes were fairly blaze about spotting cacti and camels. Our first port of call was Ait Ben Haddou, a fortified kasbah accessed by stepping stones across a river. The children loved crossing the river this way and loved even more the fact that there are no barriers and no wardens so they could run wild and explore every nook and cranny. Heading away, we still had another hour's journey until we reached our accommodation. This is the thing about the desert in Moroco, the distances are long, there's no getting around the fact. Long journeys in the care - lengths that you wouldn't contemplate at home - become a necessary evil, although nothing that a packet of pringles and a cd can't resolve. We stayed in a palmery - which is an oasis - in a hotel that had a pool and also a resident donkey, peacocks, fish and terrapins. We were all very pleased to have a car-free day and spent the morning relaxing by the pool. In the afternoon, we went for a walk through the palm groves, passing huge palm trees, massive cacti and lush farmland. A local farmer waved us over and took us on a tour of his land. The children were very keen, but we held back a little, in a very reluctant British kind of way. He was lovely, showing the girls the plants and giving them all a peacock to take with them on their walk. I strolled on feeling mortified. I had assumed he was after money or a tip, but he was just being friendly. 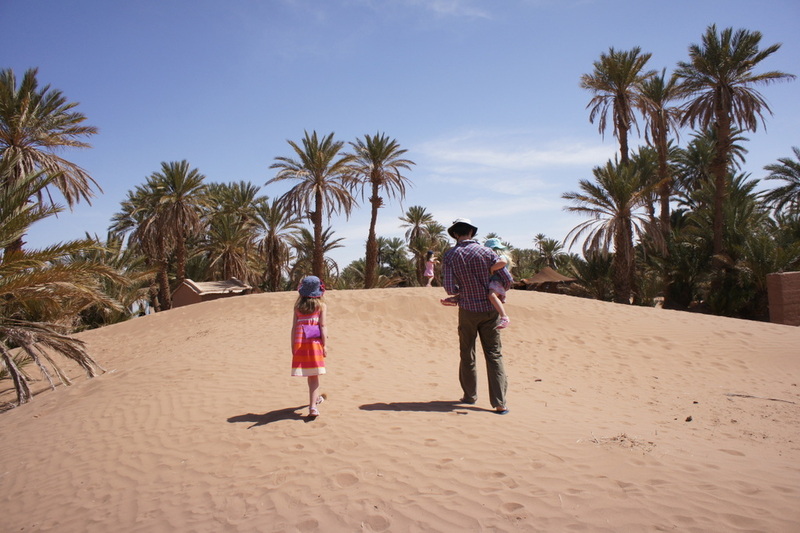 We headed off the next day, further into the desert to reach the Sahara and the dunes. By now, we were all getting onto the swing of things. No one blinked when we heard the call to prayer, everyone had got used to our sandy surroundings and the children had even tried cous cous. Upon arrival at our guest house for the night, the children were ecstatic. There were dunes to play on in the back garden and a long game of hide and seek ensued. The cook, knowing it was our youngest's 3rd birthday, cooked a delicious chocolate cake and the evening turned into an impromptu drumming session. I can't tell you what time we went to bed, but the vision of my youngest daughter playing the bongoes looking like animal from the muppets, will stay with me for a long time. 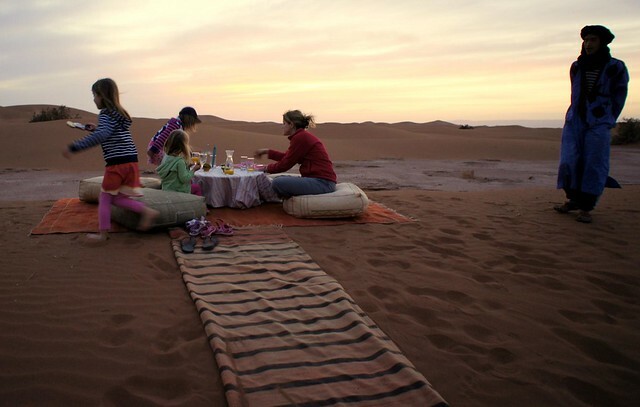 For this holiday, we had decided to have two desert experiences - a night in a luxury desert camp on the Erg Chegaga dunes and a night wild camping in the dunes close to M'hamid. 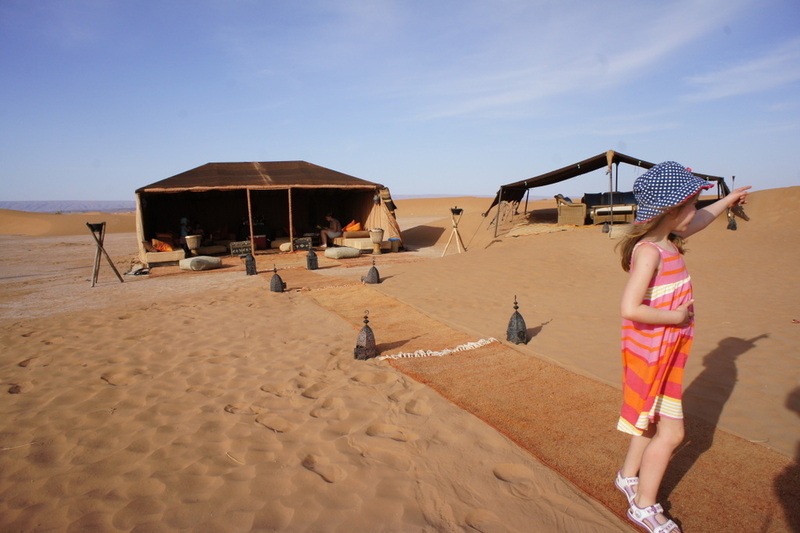 Our first point of call was the luxury desert camp. The bad news was that we faced a further 2 hours in a 4WD, the good news was that the children were shattered after their evening drumming session, so slept all the way. Passing herds of camels and the odd nomadic farmer, the camp was incredibly remote and very special. The tents had real beds in them with the most comfortable bedding I ahve ever slept in and also came with en-suite facilities. Upon arrival, we were offered a drink and the children were let loose to play. 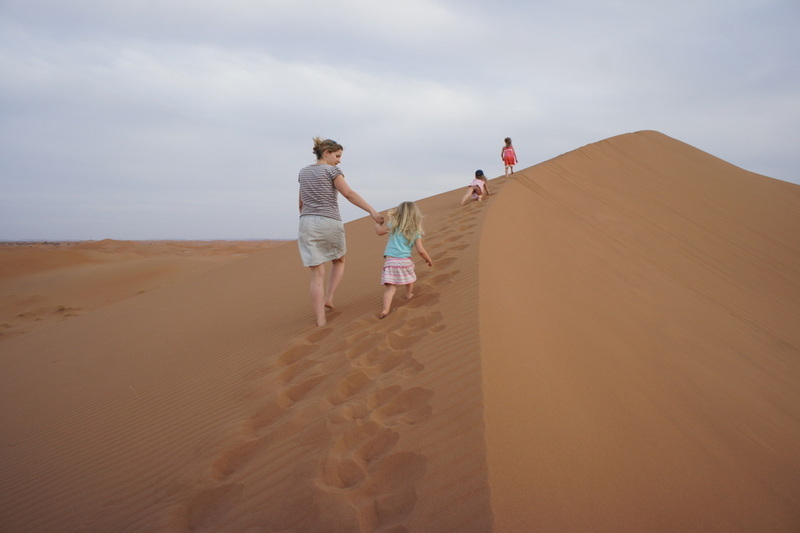 There are a few games there, but really all they wanted to do was to run up and slide down the dunes. With the children getting sand in every orifice and my husband heading out for a spot of sand boarding, I had time to lie back on a sun lounger and read.. heaven. After sun-downers and a delicious dinner, the children were put to bed and we sat and watched the stars from the warmth of the camp fire. 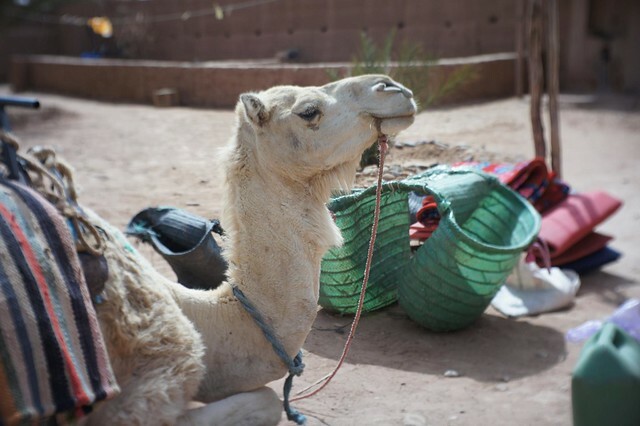 The following day, we left luxury behind and set off on our camel trek. If you have ever been on a camel, you'll know that you get on when it's lying down and it then stands up with you on it. This (and the getting down) can be very alarming and for my 4 year old the experience was all to much. My romantic vision of us heading out to the sunset on our elegant dromedaries was shattered by her screams, which lasted a full 15 minutes. Once she was calm, she soon decided that she loved camels - a sentiment echoed by her sisters. After 2 hours (and a very sore bum) we arrived and played on the dunes whilst our dinner was prepared. This time, we were staying in a very basic set up, with no facilities. The next day, we were due to leave and we said a very emotional good bye to our guide and the cook at the guest house who had been constantly feeding us with cakes and biscuits. We made our way slowly back to Marrakech and all too soon we were on the plane to come home. I look back at our holiday now and still can't believe what a fantastic time we had. Being somewhere to different we had all pulled together and had become a tight-knit unit. We had enjoyed every meal sat round a table together, had played games together and had explored together. And what's more, it had been just as much of an adventure for us as it was for the children. They were very pleased to be home, of course, especially my middle child who had been craving Chicken nuggets, but we were all sad that the holiday had come to an end. The children are quick to tell everyone they meet about it and my youngest still insists on saying goodbye in Arabic, much to the bemusement of her pre-school teachers. As for me, would I do it again? Yes, in a heart beat.